Unlike herbal remedies or aromatherapy’s essential oils, flower essences mediate their healing without pharmacologically active molecules. Representing a higher vibrational octave of the plant’s herbal or molecular properties, flower essences energetically restore balance on physical, emotional, and spiritual levels. Because physical disability has so many nonphysical components at the deepest soul level, flower essences greatly expand the healing armamentarium available to individuals with physical disability, such as spinal cord injury (SCI) and multiple sclerosis (MS). Because no biologically active molecules essentially exist in a flower-essence solution, it can be difficult for a biochemist like me, trained to explain biological phenomena through molecular interactions (e.g., neurotransmitter interacting with a receptor on the neuronal cell surface), to understand how essences can possibly work. It requires that we revisit a concept inherent to most ancient and indigenous healing traditions - that our body’s physiology and biochemistry is a function of us being, first and foremost, beings of energy. Flower essences were developed based on intuitive observation, and, until recently, have lacked scientific scrutiny. However, to put this lacking into better context, the Congressional Office of Technology Assessment concluded that only 10-20% of medical interventions physicians practice are scientifically proven. Most conventional, as well as alternative, medicine is based on a history of use and experience. The results of modern science’s carefully designed clinical trials are only a small fraction of our healthcare reality. Flower essences’ mind-body-and-spirit healing is difficult to explain with traditional biomedical precepts. To help us understand it, we need to briefly review some key principles that distinguish conventional, allopathic medicine from energy-based healing traditions. Reflecting Isaac Newton’s seventeenth century physical laws and Rene Descartes’ philosophy of mind-body duality, a mechanistic medical approach was adopted that saw the body as a machine composed of parts. Fix the parts, and you fix the machine. In contrast, the energy approach to healing believes that our mind, body and spirit are holistically integrated because we are beings of energy. The emphasis is on the whole not the parts. Over the ages, our energy system has been described in many ways, such as qi circulating through acupuncture meridians, prana flowing through chakras, vital force, or electromagnetic energy fields by modern physicists. Because mind-body-and spirit healing sounds too intangible for scientific scrutiny, scientists had to invent a new, intimidating-sounding discipline called psychoneuroimmunology (PNI) to help explain the mechanisms by which emotions and attitudes can affect physical health. The differences between the mechanistic and energy-healing perspectives have profound implications when it comes to disability. For example, conventional medicine assumes that physical health produces happiness and, therefore, considers that emotional reactions, meaning of life, and belief systems to be irrelevant to medical practice. In the energy model, happiness leads to physical health, and, consequently, our beliefs, the meaning we attach to routine events, and our emotional reaction to these events are crucial to health promotion and maintenance (see Trieschmann, R.B., Rehabilitation Education Vol. 9, No. 2, pp.217-227). Some people speculate that our attitudes and emotions are transformed into our biochemistry and physiology through subtle electromagnetic fields that permeate and surround our bodies. It is through these fields that flower essences are said to exert their effects. Specifically, the flower’s electromagnetic patterns that have been released into the solution interact with the body’s electromagnetic fields, restoring energetic balance and, in turn, physical health. People have compared flower essences’ subtle energetic influences to the uplifting effects we experience listening to music or seeing majestic views. For me, the problems of the world disappear when I hear Beethoven’s “Ode to Joy” or watch the sky fade into subtle lavender hues as the sun recedes over Colorado’s snow-capped Indian Peaks. The contour and arrangement of light and sound energy, including aspects that are not consciously perceived, evokes profound feelings. Through a cascade of PNI mechanisms, these feelings manifest into beneficial and measurable physical changes. Although a part of ancient healing traditions, English physician Edward Bach (1886 – 1936) catalyzed flower essences’ modern re-emergence. A conventionally trained physician, Bach (photo) specialized in bacteriology and vaccine development. He later shifted to homeopathy, philosophically a close relative to flower essences. In 1930, Bach quit his practice and devoted the last six years of his life to developing his now well-known 38 flower essences. Because each plant has the potential to be transformed into a unique healing essence, many new flower essences have been developed in response to the therapy’s popularity. Although a miniscule amount compared to the $100-billion pharmaceutical industry, the U.S. flower-essence market has grown to over $5 million. Flower essences are prepared by placing flower petals - the plant part believed to have the most life force - into a glass bowl of water. 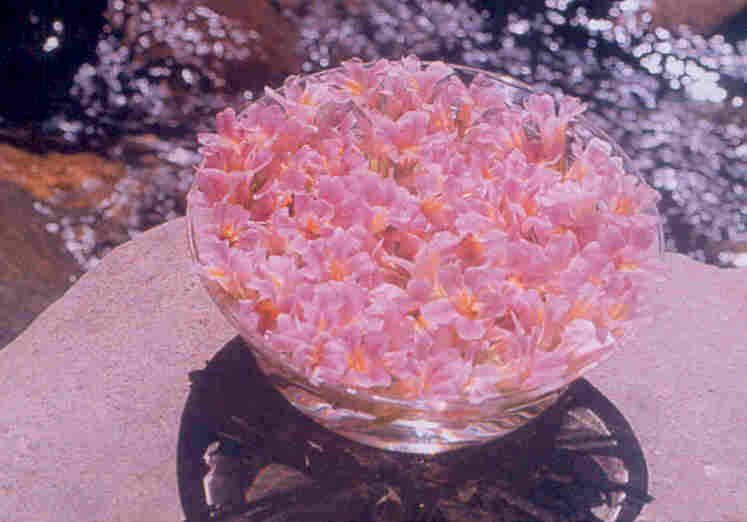 The bowl is placed under sunlight (photo), which melds the flower’s energetic imprint into the water. Although nothing physical gets transferred, using highly specialized photographic procedures, the flower’s energy imprint has been observed on the solution after removing the flowers. This sun infusion is called the mother tincture, which, in turn, is often diluted and preserved with brandy. You commonly administer essences by placing several drops under the tongue. Patiently observing the plant and perceiving its manifold characteristics results in insights that are translated into healing attributes. These attributes are usually defined at the emotional and mental level and often verified through user feedback. Because of the plethora of available essences, selecting the right ones can be difficult. Traditionally, you would attempt to identify your underlying, health-affecting, emotional and mental issues and then match these to essence healing attributes as listed in various resources or repertories. For example, the Bach Sweet Chestnut, Gorse, Wild Oat and Wild Rose essences are indicated for depression or despair-related health issues. Due to the difficulty in accurately identifying health-affecting core issues, a muscle-testing procedure - called kinesiology - can be used to select essences. You hold an essence in one hand while another person attempts to gently force down the opposite outstretched arm. If the remedy energetically resonates with you, it will subconsciously increase your strength, and you will resist more force than with an unneeded remedy. Machelle Small Wright, Perelandra flower essences creator, has simplified this procedure by developing a self-test involving finger strength, as well as alternative procedures when disability inhibits finger testing (see Flower Essences: Reordering Our Understanding and Approach to Illness and Health, Perelandra, Ltd., 1988). Although kinesiology theoretically eliminates the need to identify often complex and vague underlying mental and emotional health determinants, it requires some skill gained through experience. Without the skill, flower-essence selection can be a hit-or-miss process. Fortunately, several combination remedies are available that provide wide-spectrum healing protection. For example, the Bach Rescue Remedy, composed of five key flower essences, exerts a stabilizing effect for many physical and mental stresses. This product alone represents 43% of the U.S. flower-essence market. Based on nearly 70 years of case studies, the remedy is considered the emergency first aid of flower essences because it prevents the disintegration of our energy system after physical or emotional trauma, thereby, promoting physical recovery. Another popular combination remedy is the Flower Essence Society’s Yarrow Special Formula. Developed in response to the 1986 Chernobyl Nuclear plant disaster, the remedy protects your energy field’s integrity from harmful environmental influences, especially from all types of unnatural radiation that now ubiquitously affects modern society (e.g., dental x-rays, airport detection devices, computer monitors, cellular phones, etc.). Concepts of soul healing and molecule-independent energy mechanisms are troublesome for most scientists. Nevertheless, Dr. Jeffrey Cram, a clinical research psychologist with extensive scientific credentials, has shown in several controlled studies that flower essences can, indeed, exert measurable physiological effects. Specifically, Cram’s studies show that the aforementioned combination remedies can reduce the stress response induced by various situations as measured by skin temperature and conductance and various electrophysiological parameters, such as brain waves and muscle electrical activity. Intriguingly, the flower-essence responses were especially notable at locations corresponding to specific chakra sites, which according to ancient wisdom are the points in which the flow of life-force, pranic energy into the body is the greatest. Cram is also conducting a study examining the use of flower essences to treat depression. Preliminary results indicate that the essences have comparable effectiveness to many antidepressant drugs. Flower essences expand the healing armamentarium available to people with spinal cord dysfunction, enhancing health and wellness and, therefore, potentially reducing the side effects associated with a heavy medication burden. Unfortunately, little focus has been placed on the therapy’s healing potential uniquely relevant to spinal cord dysfunction. Some people theorize that spinal cord dysfunction profoundly disturbs the body’s energetic patterns, inhibiting physiological healing. With this view, any therapy that stabilizes these patterns has healing potential. Wright speculates that flower essences are one of these therapies. In one of her audio resources, Wright uses her finger-test procedure to establish a flower-essence treatment regimen for a woman with multiple sclerosis. The procedure revealed an intricate regimen, suggesting that the woman’s multiple sclerosis was due to numerous, interacting factors. As the woman continued her regimen over time, her MS symptoms gradually and permanently disappeared. The book Flower Essences and Vibrational Healing (Gurudas, 1989, Cassandra Press) briefly alludes to several essences that may have relevance to spinal cord dysfunction. For example, bo (native to India), California poppy, and chamomile flower essences are listed as useful for multiple sclerosis; and comfrey and khat (native to Africa) essences are indicated as potentially beneficial for rejuvenating or regenerating damaged neurological tissue (all available from Pegasus Products). The poppy and chamomile essences supposedly enhance the body’s assimilation of gold, the lack of which according to the medical intuitive Edgar Cayce is responsible for causing or aggravating many neurological disorders, especially multiple sclerosis. Because spinal cord dysfunction has so many non-physical aspects at the deepest soul level, flower-essences’ mind-body-and-spirit approach may have the potential of expanding our healing spectrum beyond therapies that are just directed to the physical. Although flower essences’ underlying philosophy has, until recently, fallen beyond the pale of orthodox scientific thinking, if there is one scientific truth it is that today’s cutting-edge insights are often tomorrow’s anachronisms. Special thanks to Jeanette Edwards of Perelandra Center, Fred Rubenfeld of Pegasus Products, Jeffrey Cram of the Sierra Health Institute, Janice Shade of Nelson Bach, USA, and Richard Katz and Patricia Kaminsky of the Flower Essence Society. “Flower Essences: Reordering Our Understanding and Approach to Illness and Health” by Machelle Small Wright, Perelandra, Ltd. (1988). “The Human Electrical System and Flower Essences” (videotape), by Machelle Small Wright, Perelandra, Ltd. (1996). (call 800-960-8806). “Flower Essences II Workshop: Perelandra Tape Series 6” (audiotape) by Machelle Small Wright, Perelandra, Ltd. (1993). (call 800-960-8806). “Flower Essence Repertory: A Comprehensive Guide to North American and English Flower Essences for Emotional and Spiritual Well-Being” by Patricia Kaminski and Richard Katz, The Flower Essence Society (1996). “Flowers that Heal: How to Use Flower Essences” by Patricia Kaminski, Gill & Macmillan, (1998). “Flower Essences and Vibrational Healing” by Gurudas, Cassandra Press (1989). “The Bach Flower Remedies. The Unique Healing Treatment: Why it Works and How to Benefit from its 38 Powerful Essences. “ Keats Publishing (1997). “Bach Flower Remedies to the Rescue” by Gregory Vlamis, Healing Arts Press (1990). “Bach Flower Therapy: Theory & Practice” by Mechthild Sheffer, Healing Arts Press (1988). “The Essential Flower Essence Handbook,” by Lila Devi, Hay House, Inc. (1996). “Vibrational Medicine for the 21st Century” by Richard Gerber, HarperCollins Publishers (2000). “Effects of Two Flower Essences on High Intensity Environmental Stimulation and EMF” by Jeffrey R. Cram, Proceedings International Society for the Study of Subtle Energies and Energy Medicine, (2000), pp.31-33. Flower-essence remedies can be readily purchased at nutritional stores, or through mail-order catalogs or the Internet. Perelandra Center for Nature Research: 800-960-8806 or 540-937-3360 or www.perelandra-ltd.com. Pegasus Products: 800-527-6104 or 970-667-3019 or www.pegasusproducts.com. Nelson Bach USA Ltd.: 800-319-9151 or 978-988-3833 or www.nelsonbach.com. Flower Essence Society: 800-936-7222 or 530-265-9163 or www.flowersociety.com. Adapted from an article appearing in Paraplegia News, July & August, 2001 (For subscriptions, contact www.pn-magazine.com).